We all know how we feel after a long day. Our muscles are tired, our legs heavy, our eyelids ready to close. Though sleep may seem as if it originates in the body, the brain controls each aspect of slumber, from the feeling of sleepiness to dreaming to waking up. Every living organism, from the smallest to the largest, needs sleep. Sleep is an intricate process that involves light and dark signals, specialized genes, and an array of neurotransmitters and hormones. We do not simply “drop off” into sleep; our brains orchestrate this state of altered consciousness with complex precision. The process of sleep starts with the circadian rhythm, a system of biological clocks located in the brain and throughout the body in organs and muscle tissue. Each clock consists of specialized pacemaker cells that operate on a 24-hour cycle. Nerve cells, or neurons, act as the nervous system’s unit of communication. 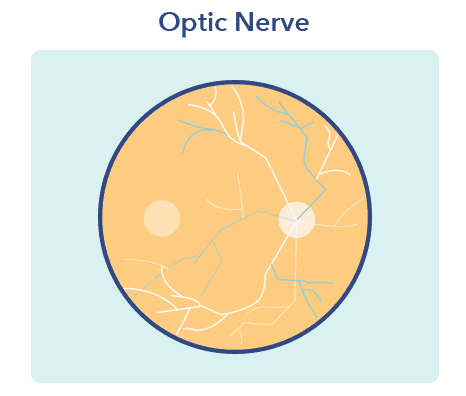 Certain cells in the optic nerves are responsible for sending light and darkness signals to the brain. This helps signal the circadian rhythm to activate neurotransmitters that make us feel alert or sleepy. Each individual’s circadian rhythm is shaped by a combination of environmental cues, genetic predisposition, chemical release in the body, and lifestyle choices such as work and travel schedules. Adenosine plays a crucial role in the sleep-wake cycle. 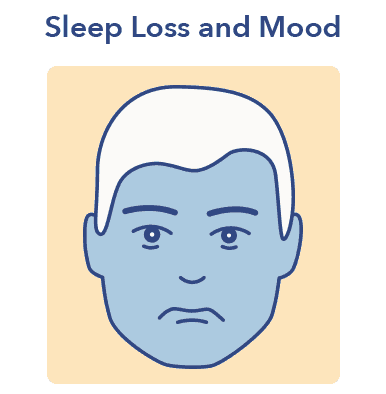 In the brain, adenosine acts as a central nervous system depressant that promotes sleep. Over the course of a day as ATP releases energy, levels of adenosine build up in the parts of the brain associated with feeling alert. This leads to the eventual “switching off” of neurotransmitters responsible for wakefulness and an increase in the drive to sleep. The sleep-promoting hormone melatonin may also help increase levels of adenosine. These hormones and neurotransmitters work in concert with the circadian rhythm and light-dark signals to reduce alertness and bring on feelings of sleepiness. (4) Sleep rapidly diminishes levels of adenosine, leading to a gradual increase in alertness as morning approaches and light signals reach the brain. Q: Why does caffeine make us feel more awake? A: Caffeine fits into the body’s receptors for adenosine, blocking its sleep-promoting effects and increasing feelings of alertness. Even during the deepest stages of slow-wave sleep, the brain does not shut down or go dormant. 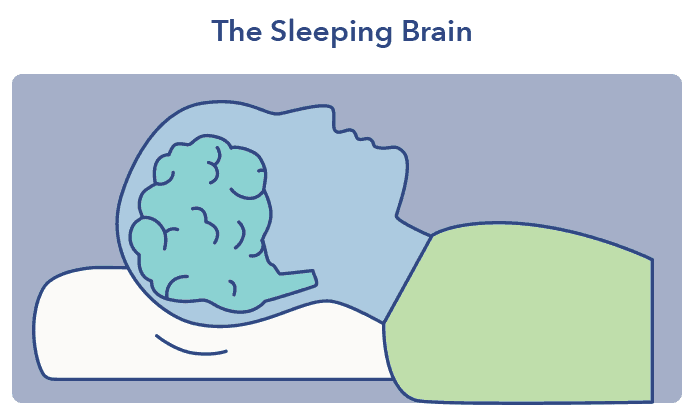 Though sections of the brain rest at various times during sleep, the brain is active during all four sleep stages. Some of the brain’s nighttime activities include cleaning itself, processing emotion, and consolidating memories. The process of debris removal in the brain and body is known as phagocytosis. 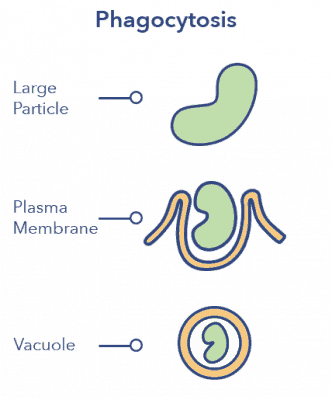 During phagocytosis, a cell uses its plasma membrane to surround a particle and wall it off in a tiny pocket called a vacuole. Phagocytosis is healthy when cells consume and destroy harmful substances such as bacteria, but when phagocytosis misfires due to sleep loss and consumes essential nerve cells, it may be described as the brain eating itself. Though the studies of mouse brains have not been replicated in human beings, sleep deprivation in the human population is known to cause excessive build-up of the same toxic proteins associated with dementia. The engulfing of a pathogen or particle of cell debris by another cell. Phagocytosis is one of the essential functions of the immune system. Sleep may help in the processing of emotion due to the absence of the neurotransmitter norepinephrine in the brain during REM sleep. During REM, vivid dreaming occurs and norepinephrine is at its lowest point in the 24-hour sleep-wake cycle. Norepinephrine is associated with stress and emotional reactivity, and at high levels may be indicative of a mood disorder such as depression or post-traumatic stress disorder. Q: What is norepinephrine? A: Norepinephrine is a neurotransmitter that incrreases alertness, prepares the brain and body for action, and focuses attention. It also increases feelings of restlessness and anxiety. Sleep appears to be instrumental in learning and memory consolidation as well as emotional processing. (11) During waking hours, the firing of multiple neurons at once leads the brain to pay attention to certain people, events, or stimuli. A car that passes by won’t excite neurons, while running into an old friend will. These notable waking experiences join the queue for memory consolidation during sleep. Sleep scientists now know that neurochemical conditions in the brain during sleep are important for the processing of memories. Part of sleep’s function as a whole seems to be the consolidation of memories, as well as the selection of important aspects of experiences to store for later recall. The brain is the engine of sleep. From the master clock of the circadian rhythm to the timed release of neurotransmitters, sleep is a complex interplay of genetic and environmental factors. Sleep is essential to all living beings, from fruit flies to whales. Though sleep is individual, the process is universal. Sleep protects and regenerates the body, and allows us to process the emotions and memories that make us human.